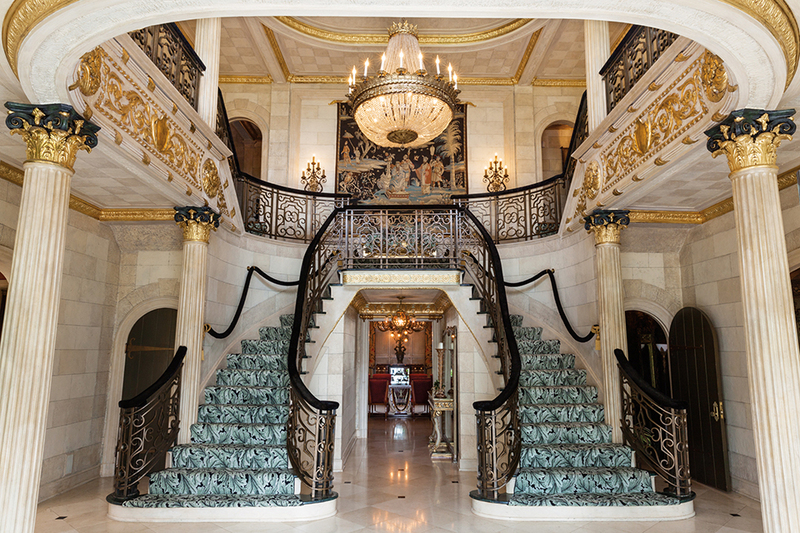 Gloria Crest, a storied New Jersey mansion that was once home to Gloria Swanson, is an architectural masterpiece. The stunning exterior includes white-glazed faience blocks and a red terracotta tiled roof, while the grand interior features two wings and a breathtaking double staircase in the entry. 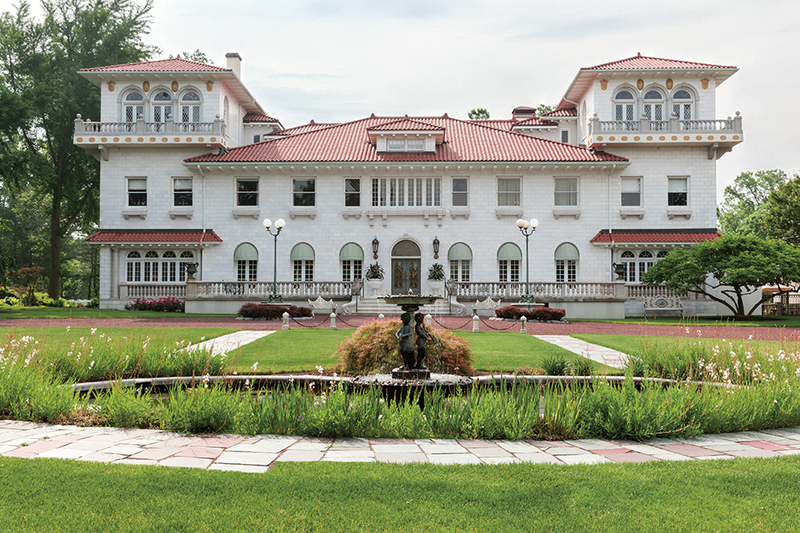 A 2016 article from Galerie Magazine recounts the mansion’s storied past, “It was built in 1926 by architect J. C. Hameltman, of Paterson, New Jersey, for Count Stefan de Poniatowski, heir to the Polish throne, and his American wife, Edith von Stohn, daughter of the owner of what was then the largest silk mill in the state. The house took years to build and cost $2.5 million dollars in 1926.” The von Stohn’s lost the house during the Depression when the family silk business failed. The article continues, “In 1936, Joseph P. Kennedy, Sr., Boston patriarch of the Kennedy clan, was on the board of the Lincoln National Bank of New Jersey when it repossessed the Poniatowski house. Kennedy bought it for his mistress, the actress Gloria Swanson, who lived there for six years." 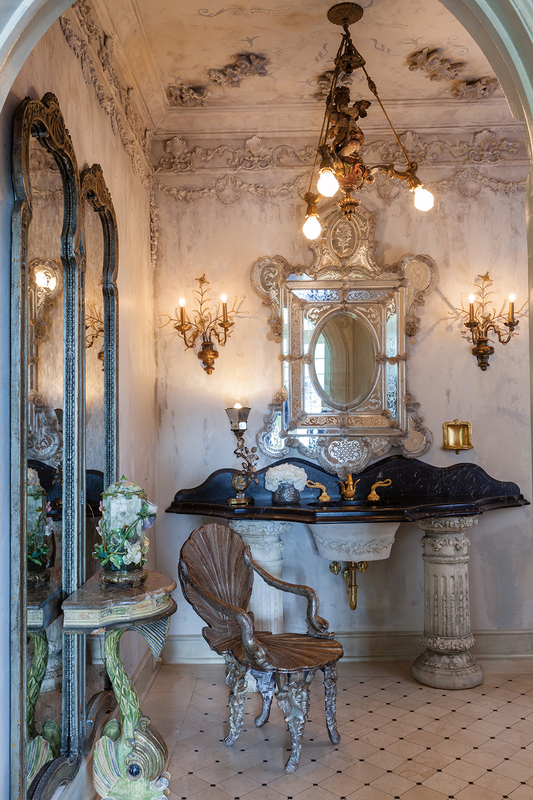 In 2000, the current owners lovingly restored and furnished the home and gardens to their original glory, acquiring pieces with stories as illustrious as the home itself. 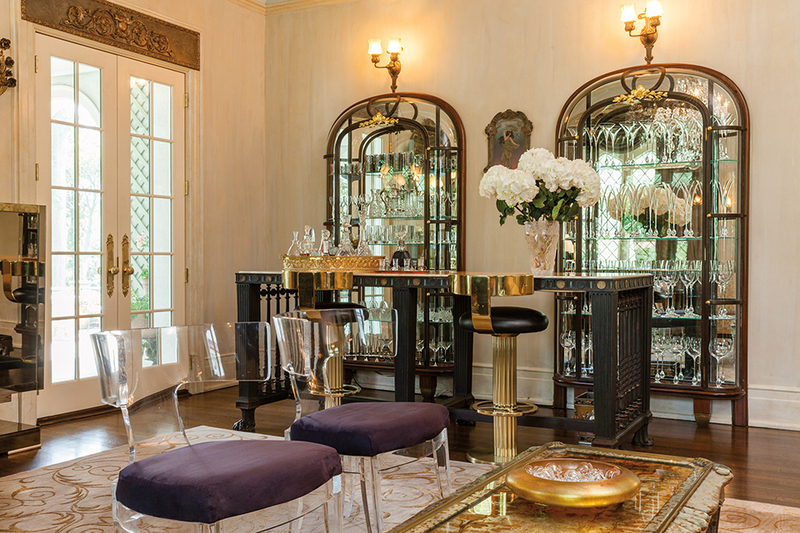 Highlights include an impressive painting by Paul Francois Quinsac, a pair of vintage Cartier vitrines and a dining room suite that once adorned the Jockey Club of Sao Paulo, Brazil and purportedly belonged to Walter Chrysler. The collection also features an impressive selection of garden furniture and sculptures, including a pair of monumental cast iron garden urns on pedestals that stand nearly 13 feet tall. 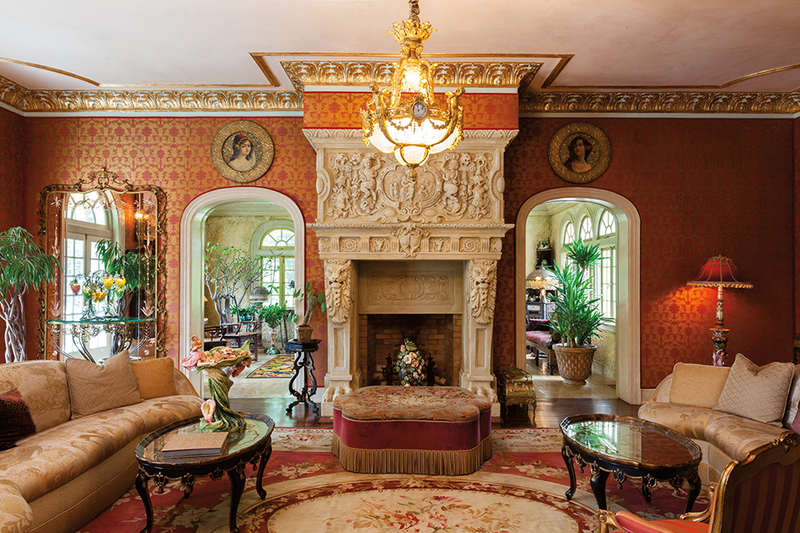 New Orleans Auction Galleries is pleased to offer antiques and fine art from Gloria Crest Mansion in the May 19-20 Estates Auction. New Orleans Auction Galleries would like to thank Phyllis Lasser of Coldwell Banker for this video. h. 33-3/4", w. 11", d. 14"
20th century, consisting of a circular table with a floral-decorated top and floriform pedestal, h. 30", dia. 43", together with ten chairs, each with a seat in the form of a blooming flower on a floriform standard, h. 26", w. 19", d. 16". Provenance: Christie's, New York, October 25, 2007, lot 398.
the table top with scrolled, inlaid brass work and mounted to a central carved, painted and parcel-gilt standard, with four additional corner legs mounted to a shaped platform base, h. 30", w. 48", l. 158", the chairs with padded seats and backs and raised on carved and parcel-gilt slender cabriole legs, h. 37". 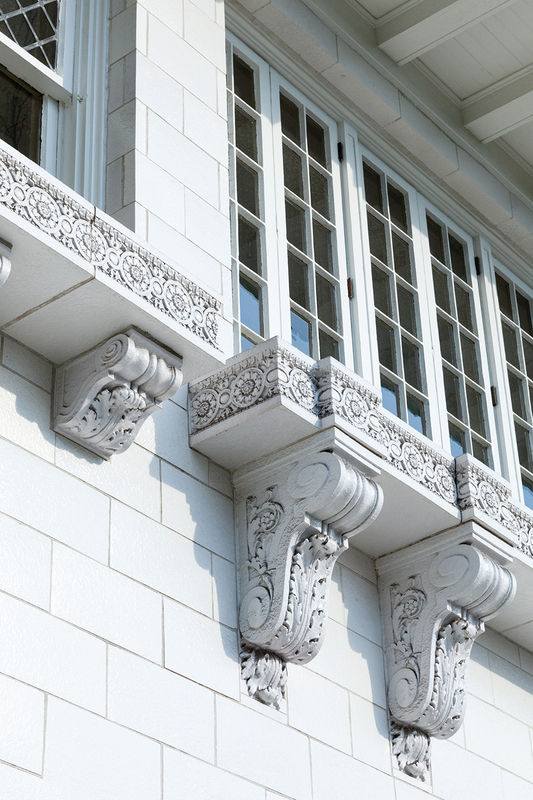 Provenance: The Jockey Club of Sao Paulo, Brazil to the Walter P. Chrysler Boardroom.